RSAP Group, with more than a thousand employees, of which more than 600 abroad, is one of the leading Italian groups in the European heating industry. IRSAP is among the first company to introduce in Italy, in 1967, the mild steel tubular radiator and the very first to make towel rails in Italy back in 1983. Today, still a family business arrived at the fourth generation the company want to renovate entering into the furniture industry. Product typology: you are invited to design two electric radiators for domestic use, conceived for the bathroom and for the living area respectively, that even if they share the same family feeling they also have a series of characterizing elements that make them different, based on their specific functions and use. Functions: your radiators shall mainly be meant for heating the environment where they are placed and at the same time serve as furnishing items that may enhance the aesthetics of the environment, just like other furnishing accessories. Indeed, depending of their use, the radiators might have specific functions: for example, the radiator for the bathroom must provide the possibility to heat towels and hand towels; the radiator for the living zone, might have additional functions, for instance concerning the lighting of the environment, the sound absorption, etc. Size and modularity: the size of each radiator shall not exceed 200cm for the height and 75cm for the width. The minimum depth will depend on the technology employed inside, that is heating foils, heating wires and heating cartridge. In case of radiators with heating foils or heating wires, consider a minimum depth of 3,5cm. In case of radiators with heating cartridge, the depth shall be greater than 5cm. At your discretion, you may opt for a modular approach and consider the specified dimensions as the maximum size for each module, thus creating possible compositions by repeating the module. Even in this case, you are invited to show a solution in which the module is installed individually. Shapes: you are free to explore the shapes that best suit your project idea, keeping into consideration the maximum size specified and the main heating function that your radiators shall perform. Style: the family of radiators shall favour a modern and minimal style, drawing inspiration from the IRSAP catalogue and website. The two radiators shall have a shared aesthetic language and some distinctive traits, so to give each radiator its own personality depending on its destination area and the functions it shall perform. In particular, you may suggest a cover or other accessories (for ex. fissure to insert the hand towels, etc.) in order to differentiate the products. Materials: the radiators you suggest, shall be made of steel, aluminium or possibly other suitable materials. The use of glass, wood or stone is NOT allowed. Surface finishes: at your discretion, you may provide various surface finishes, including chrome-plated finish, that enhances the properties of metal, or coated with matte or glossy finish. Production technologies: the radiators you design shall be conceived in view of their industrialisation and possibly with an attention to make them easy to install. Values to convey: the radiators shall be conceived as products with a very high aesthetic value, in support of the furniture of environment, and place themselves as premium and functional products, also effective in their main function. 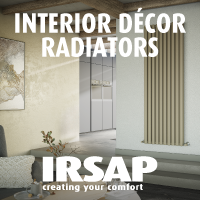 Logo: you are required to include the IRSAP logo on the radiators in a discreet way. At the moment, the logo placed on their products is 4x1cm large. You can find the logo in the Material files attached. Customer typology: the radiators shall be conceived for a customer aged between 35 and 45 years, with a medium-high purchasing power. Deliverables: upload all the images that better present your projects (rendering, descriptions, CAD files, etc.) preferably also attaching the 3D file in .STP format, inside a .ZIP archive. Concept revision: deadline for requiring an optional revision of your project by the Desall team. In order to request a revision, upload your project, include the description project and save it as draft (SAVE DRAFT) from the upload page and send your request to the Desall Team via e-mail or through the contact form. The revision is NOT mandatory: it serves only as a further opportunity for the participants but does not constitute a condition for participation, nor does it constitute any advantage in the final evaluation. Participation is free of charge and open to designers and creative talents of any nationality aged 18 years or older. Participants can present one or more projects, but only the projects published on the www.desall.com web site, via the upload page related to “Interior décor radiators” will be accepted. The selection of the winner by IRSAP will be the result of an unquestionable evaluation and it will take into account originality, feasibility and consistency with the brief presented. For the duration of the option right, the Sponsor offers an extra chance to all participants setting a fee of Euro 2,500.00= (two-thousand-five-hundred/00) for the purchase of the license for the economical exploitation of the projects not-acknowledged as the winning proposals. For more info, please login and read the Contest Agreement from the upload page. For questions about the brief please use the “Have a question” button or write to contest@desall.com We invite you to download the PDF of the brief for some extra guidelines and advices for your submission. Do you want to stay updated about "Interior décor radiators"?